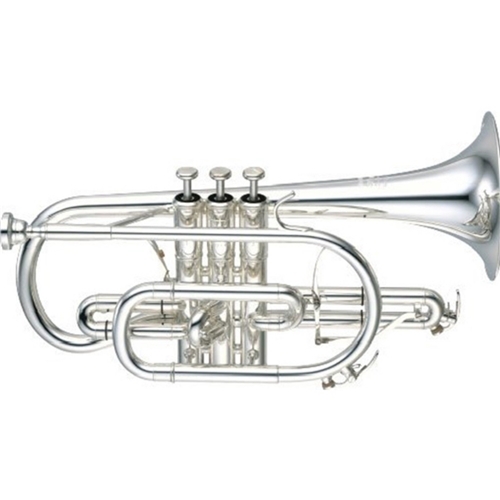 Yamaha Neo Cornets feature hand-lapped valves and slides for precision fit and smooth flow of air. The one-piece drawn gold brass leadpipe offers excellent intonation, response, and ideal resistance. Monel pistons are corrosion-proof and long lasting. The Xeno name has become well established as the brand of choice for discerning trumpet and trombone players. And now Yamaha has incorporated what they've learned developing these orchestral instruments, into some new cornets.The Xeno cornets were developed in close collaboration with some of the worlds best players and in particular David King, cornet soloist, Head of Performance Studies at the University of Salford and principal conductor of the Yorkshire Building Society band. David worked closely with Frankfurt based Yamaha R&D expert Thomas Lubitz, and the new instruments result from more than 20 years of research and experiments. Features: Leadpipe: Gold brass has been newly adopted to a part of the tube leading from the leadpipe to the valves, delivering a depth of sound and a richness in tonal variety that are required for British brass bands. One-piece bell: The one-piece bell provides for great tonal colors and improved response. Case: This custom-designed single case features a better fit and provides more protection during transportation.